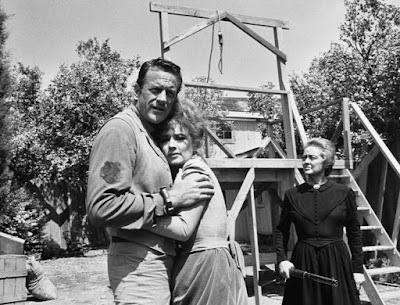 Today, I'm writing about The Jailer episode of Gunsmoke starring James Arness, Amanda Blake (center), and Bette Davis. 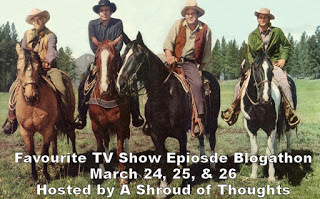 This article is part of the Favourite TV Show Episode Blogathon hosted by A Shroud of Thoughts. U.S. Marshal Matt Dillon (James Arness) faced many formidable foes in the long-running Western TV series, Gunsmoke, but few were quite as memorable as Bette Davis in the Season 12 episode, The Jailer. The Jailer begins when a group of armed men slip into Dodge City and kidnap Matt's longtime love, Miss Kitty (Amanda Blake), followed by the unsuspecting marshal himself. They take the pair to a lonely farmhouse where a black-clad widow named Etta Stone (Davis) is waiting to take revenge on Matt for hanging her criminal husband six years ago. Etta keeps Kitty and Matt locked up while her sons (Bruce Dern, Tom Skerritt, Robert Sorrells, and Zalman King) dutifully build a gallows on which to hang Matt at sunrise. However, when help from Doc (Milburn Stone) and Festus (Ken Curtis) doesn't arrive, Kitty concocts a plot of her own to get Matt out of harm's way. By 1966 Davis was a two-time Academy Award winning actress, but that didn't mean it was any easier for the 58-year-old star to get work. Davis was mostly being offered parts in horror movies, so she turned to TV for the chance to play meaty roles like that of Etta (Davis had already appeared as a guest star on several TV shows, including the Westerns, Wagon Train and The Virginian). In fact, when Dern, who co-starred with Davis in Hush. . .Hush, Sweet Charlotte (1964), asked her why she was appearing in a weekly TV series, Davis replied, "legends have to eat too." By this time the cast and crew of Gunsmoke were used to big-name stars making guest appearances, but Davis was still in a category all by herself. As Arness recounts in the video clip below, Blake idolized Davis and was extremely nervous about working with the star, but the two women ended up getting along like old friends, and Davis heaped praise on the talent and professionalism of the Gunsmoke cast and crew during promotional interviews. TV Guide named The Jailer one of the top 50 dramatic episodes of all time, and it still holds up well today. The performances are all outstanding, especially from Davis, Blake and Skerritt, and the plot has plenty of action and nail-biting suspense. In fact, one of The Jailer's great charms is how wonderfully it fits into familiar themes for Western TV shows, while also maintaining the unique and complex relationship between Gunsmoke's regular cast. Anyone who's spent an afternoon watching TV Land knows that kidnappings and lynchings were staples of small-screen oaters: Mark McCain (Johnny Crawford) was regularly taken hostage by some vengeful stranger on The Rifleman ("Lucas McCain, I've got your boy" has to be one of the most uttered lines in TV history), and it seems like one or more of the Cartwrights were about to be hanged in every other episode of Bonanza. 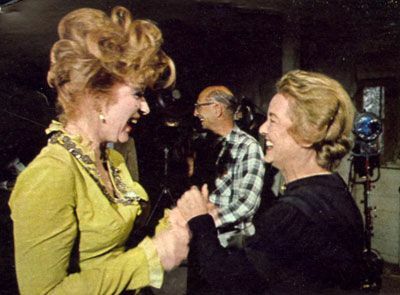 Amanda Blake and Bette Davis share a laugh on the set of The Jailer. Even among the traditions of TV Westerns, Gunsmoke was unique. Its long run -- nine years on radio, 20 years on TV -- meant that viewers regarded the characters like old friends whose personality traits and idiosyncrasies became a beloved part of their weekly routine. The Jailer follows the familiar Gunsmoke pattern closely: Doc is nonchalant, Festus is a worrywart, Kitty is feisty, and Matt is stoic even in the face of great danger (Marshal Dillon's motto was "keep calm and carry on" long before it became an Internet meme). The Jailer mostly deals with the relationship between Matt and Kitty, which is one of the longest running love stories in TV history. Viewers tuned in each week to see whether the ever-faithful Kitty would finally get a marriage proposal from the commitment-shy Matt -- Spoiler alert: she didn't -- and their decades long "will they or won't they romance" was one of the chief reasons for the success of the series, and, in particular, the success of The Jailer episode. With that in mind, I'll leave you with a video of some of the best Matt/Kitty interactions through the years. The Jailer is available on DVD and online from several video-sharing services. It is difficult for me to be critical of Gunsmoke as I've loved it since I was a kid. Luckily, they've rarely given me reason to be critical and The Jailer is one of their best and you certainly did the episode justice. Great choice. Although I heart Bonanza forever, Gunsmoke was the gold standard for TV Westerns. They consistently maintained top-notch acting, scripts, and production values for 20 years. Bette Davis is one of my favourite actresses of all time and I adore her TV appearances. In fact, one of my favourite Perry Mason episodes was one in which Perry barely appears--"The Case of Constant Doyle", in which she pinch hits for Perry! "The Jailer" is one of my favourite of her guest appearances. She made an excellent villain. Of course, beyond Bette Davis we get to see the Gunsmoke cast at the top of their game. I loved seeing more of Matt and Kitty's relationship than we usually do in most episodes. Anyway, thank you for taking part in the blogathon! Sometimes her TV roles get defined as "lesser" work, but she had complex roles and it goes without saying she gave great performances in all of the episodes. I watched this for last years Bette Davis Blogathon. It was fun to watch Bette take on television. Love all the behind the scenes info!